Director of the Institute of History of the Azerbaijan National Academy of Sciences (ANAS), MP, Academician Yagub Mahmudov plays an important role in raising highly qualified historians in Azerbaijan. According to the Institute of History, February 10 marks the 80th anniversary of Yagub Mahmudov. He was born in 1939, in the village of Bash Goynuk, Shaki district. He graduated with distinction from the Faculty of History of the Azerbaijan State University (nowadays Baku State University) in 1962. He defended his thesis for a Candidate’s degree entitled "Mutual relations between the Aghgoyunlu state and the Republic of Venice (60-70s of the 15th century)" in 1966 and his doctoral thesis on "Mutual relations of Aghgoyunlu and Safavid states with the Western European countries (2nd half of 15th – early 17th centuries)” at the Scientific Council of the Moscow State University after M.V. Lomonosov in 1989. Yagub Mahmudov worked as a scientific editor, senior scientific editor, head of editorial desk, deputy editor-in-chief on scientific affairs at the Azerbaijan Encyclopedia in 1966-1975, as senior lecturer and Associate Professor at the Azerbaijan State Pedagogical Institute (now ASPU) in 1968-1981, and as an Associate Professor, head of chair, assistant dean and dean at the History Department of Baku State University in 1981-2004. 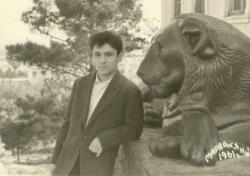 Yagub Mahmudov was dean of the History Department in 1986-1990 and 1994-2004. 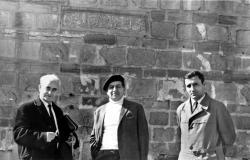 During his tenure as a dean, the department passed a decision to restore the historical name from the Azerbaijan State University of the Order of Red Banner of Labor named after S.M.Kirov to Baku State University (BSU). Since then, the university has been operating under its own historical name. It was exactly then, when Yaqub Mahmudov resigned from his position as dean in 1990, preventing the dismissal of a group of students from the History Department which was one of the centers of national liberation movement. Yagub Mahmudov has been serving as head of the Ancient World and Medieval History Chair of the History Department of BSU since 1991. The formation of the chair is connected with his name. Yagub Mahmudov led the expert working group, which developed the first Education Law of the Republic of Azerbaijan in 1991-1992. In accordance with the draft law which was submitted by him and adopted by Milli Majlis, the country embarked on a modern education system. He is the author of the "History of Azerbaijan" and "History of the Middle Ages", the first manuals of the country’s independence period. 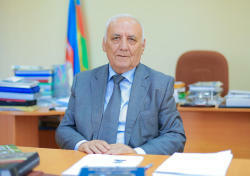 Yagub Mahmudov worked as the Deputy Chairman of the Supreme Attestation Commission of the Republic of Azerbaijan in 1992-1993 and Director General of the Polygraphic Union of Publishing House of “Azerbaijan Encyclopedia”. Yagub Mahmudov is the Director of the Institute of History of ANAS since 2004. He was elected as a corresponding member of ANAS in 2007, and its full member in 2017. He is the author of more than 1000 scientific works. He is heading the scientific schools he established in the field of history of diplomacy, the lost lands, and the history of genocides, as well as the “History of Azerbaijan in the primary sources” project. His works have been published in a number of foreign countries (Moscow, London, Washington, New York, Ankara, Istanbul, Rome, Cairo, Seoul, Mexico, Islamabad, Los Angeles, etc.). A school of historians, including 65 PhDs and Doctors of Sciences has been formed under his direct scientific supervision. Yagub Mahmudov was awarded the “Shohrat” Order (1999), "Sharaf" Order (2009), "Ataman Anton Golovaty" Order (2013), “100th Anniversary of the Azerbaijani Police (1918-2018)” a jubilee medal of the Republic of Azerbaijan (2018), and the “Parliament” medal of Milli Majlis of the Azerbaijan Republic (2018). He is a laureate of "Yusif Mammadaliyev", "Rasul Rza", "Qizil qilinc", "Qizil qalam", "Samir Asgarkhanov", "Humay", "Friend of youth" awards. Yagub Mahmudov is an Honored Scientist and State Prize laureate of the Republic of Azerbaijan, an honored scientist of the Republic of Dagestan of the Russian Federation and a full member of the International Academy of Modern Sciences named after Lotfi Zadeh. Yagub Mahmudov worthily represents Azerbaijan’s science of history on a global scale. He was honored with the title of "The Name in Science", "The Best Chief Manager" and International Award after Queen Victoria. He was included in the list of famous scientists of the 21st century. In 2016, Yagub Mahmudov was conferred upon “Abbasgulu Agha Bakhikhanov” award for his contributions to researching the history of the statehood of Azerbaijan and discovering historical truths against the Armenian falsifications. In 2019, he received the “The Friend of Youth” Award established by the Institute of History for his role and services in raising young people as scientists. Yagub Mahmudov is a member of the Political Council of the New Azerbaijan Party, and a member of Milli Mejlis of the Republic of Azerbaijan since 2000. He was the great leader Heydar Aliyev’s and then Ilham Aliyev’s advocate in the presidential elections, and accompanied them during several official state visits. National leader Heydar Aliyev praised Yagub Mahmudov's scientific activity and called him a "great scientist" and a "great historian" of Azerbaijan. Yagub Mahmudov is married. He has a son (Turkhan), two daughters (Aynur and Gulnur) and five grandchildren (Naila, Khagan, Sarah Khatun, Alp Arslan and Yaqub).